[BN] Blitz newsletter: Which Bills player has the safest roster spot? This question came up in Jay Skurski's weekly Bills mailbag. If your brain went to LeSean McCoy, try again. Keep in mind that this is not the same as asking who is the Bills' best player. Thinking about "safe" roster spots requires a consideration of contract status, talent, replaceability, and other factors. Skurski came up with left tackle Dion Dawkins on offense and cornerback Tre’Davious White on defense -- two players on their rookie contracts who have performed admirably. 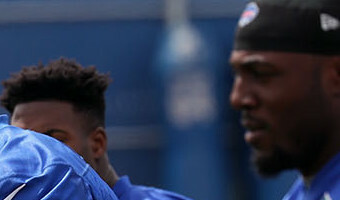 Bills take shot on low-risk Odighizuwa: "The Bills have a glaring need for edge rushers," Mark Gaughan wrote. "It makes perfect sense for them to bring in some low-risk candidates and see if they can get lucky." Enter Owa Odighizuwa (pronounced Oh-DIGGY-zoo-wah), whom the Bills signed for the minimum. Can the former third-round pick turn things around in Buffalo? Jim Kelly brings message of hope to Ohio high school stars: Jim Kelly was in Canton, Ohio this week to speak at a high school awards … [Read more...] about [BN] Blitz newsletter: Which Bills player has the safest roster spot?